Every cat owner will relate to the message on this sign, as their exasperated pet will undoubtedly have driven them mad at one time or another with repeated meowing which no amount of cat food, stroking, door opening and/or closing and general attention will have appeased. 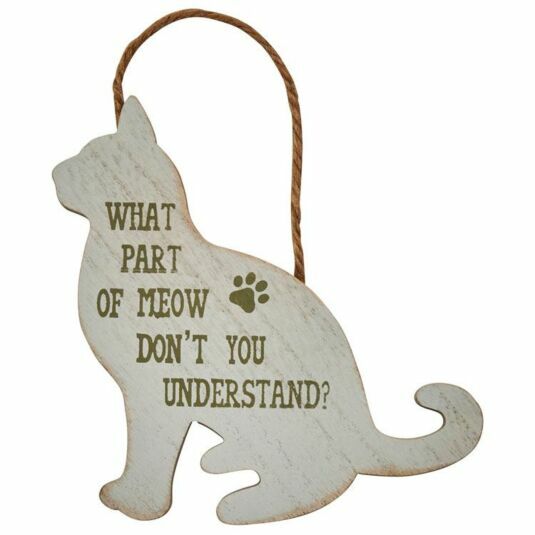 We don’t understand them, but still we love them, and this little decoration from Transomnia is testament to our long-standing relationship with our feline friends. There is a cat paw print beside the words, and the sign hangs by a piece of attached twine.